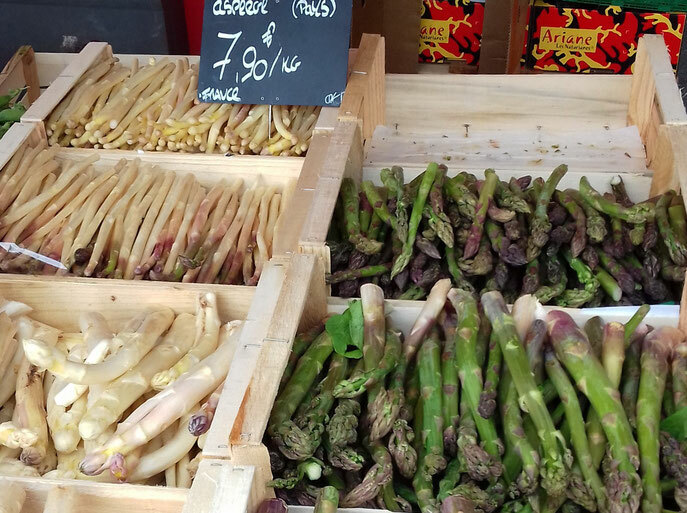 It's asparagus season and once again there are green bundles piled high on Gourdon's market. This always feels like an encouraging sign - it's when we know that spring is here for sure! Wild asparagus originates from the temperate regions of Eurasia (Central and Southern Europe, North Africa, Central and Western Asia). But it is only around the 15th century that we find traces of asparagus cultivation in France. In the 16th century, asparagus was so appreciated at the court of France, that it was considered as the queen of vegetables and was called le légume royal, (royal vegetable), le printemps en tiges (spring in stems) or l'ivoire à manger (edible ivory). Until the 19th century, asparagus remained a luxury product, accessible only to the wealthy. It only began to become "democratized" with the improvement of farming techniques and the appearance of new varieties. The cultivation of asparagus sprouted first in the Paris region, then in the Loire Valley. Asparagus then conquered Aquitaine, Provence and the South of France. Today, a whopping 20 000 tonnes of les asperges (f) are grown every year throughout France, by more than 3 000 producers on about 4 500 hectares of land. Asparagus changes colour depending on its exposure to sunlight. Each asparagus colour is distinguished by a different taste and characteristics: green asparagus for example does not need to be peeled, unlike the white and purple. It's simply a question of taste... and colour! White asparagus has been grown exclusively in the soil. The mound is covered with an opaque tarpaulin to limit the impact of light. The asparagus is harvested even before it comes out of the ground, using an elongated instrument to cut the asparagus underground. Purple asparagus is produced under the same conditions as white asparagus except for some slight exposure to the sunlight. It is harvested when the tip protrudes out of the ground, thus colouring all or part of the asparagus, first in pink then in purple. Green asparagus grows entirely above ground and is exposed to sunlight for several days. The concentration of its pigments increases, at the same time as the chlorophyll synthesis begins. Green asparagus is simply harvested with a knife. France's most celebrated asparagus eater (and other interesting facts...)! 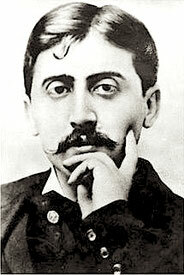 Proust was therefore one of the 40% of people able to smell the volatile sulfur derivatives eliminated by the kidneys in the urine, especially thiomethane CH3-SH, after eating asparagus. Grimod de La Reynière acquired fame during the reign of Napoleon for his sensual and public gastronomic lifestyle. He said that asparagus should only be eaten by the rich because it isn't substantial and is an aphrodisiac. Marcel Proust - "A la recherche du temps perdu"
Sources: L’association Asperges de France, General Census of Agriculture 2010 and Franceagrimer, the F & L channels, 2014 data, January 2016 edition).